Warroad drove south to St. Paul in the spring of 1969, bringing with it a buzz unlike the state tournament had ever experienced. Even as Bouchamania swept through Bloomington’s Metropolitan Sports Center, fans began to take notice of another Warroad defenseman. Like Boucha, a sophomore named Alan Hangsleben rarely left the ice. Hangsleben didn’t yet have Boucha’s size or rushing skills, but his rink savvy and ability to move the puck quickly out of the Warriors’ zone helped propel Warroad all the way to the championship game against Edina. 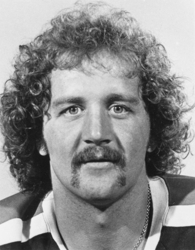 Al Hangsleben was a fan favorite with the WHA's New England Whalers and NHL's Washington Capitals during his 10-year pro career. Hangsleben grew up on a farm outside Warroad. His introduction to hockey came in the form of a cardboard box his mom brought home from an auction. Inside the box was an old pair of skates. A nearby ditch, which Hangsleben said provided a patch of ice no bigger than 5 feet by 20 feet, served as his first skating rink. Hangsleben said he was just 5-foot-7, 165 pounds in high school. His father, though, was a big man –– standing all of 6-1 and weighing in at 250 pounds of muscle packed on muscle. Like his father, the younger Hangsleben was farm-raised strong. When he wasn’t tossing bales of hay, Hangsleben was boosting 90-pound sacks of potatoes into trucks for delivery. All those “workouts” helped mold Hangsleben into a middle linebacker on the football team and pitcher and catcher on the baseball team. College recruiters from around the nation and representing all three sports were lining up to acquire his services. Hangsleben said he could have gone to Arizona State to play baseball. Hangsleben’s future was in hockey. That was clear even during his sophomore year playing in the immense shadow cast by Boucha. In what many high school fans and historians consider one of the most thrilling games in state tournament history, Boucha was injured and left the ice during the second period of Warroad’s championship showdown with Edina. With Boucha gone and Warroad trailing 4-2, there seemed little hope the Warriors could keep the game close, much less win. 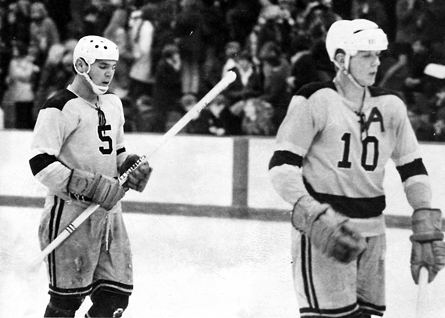 The pro-Warroad crowd was stirred to life by Frank Krahn, who scored twice in the second period –– the second goal coming on an assist from Hangsleben –– to tie the score at 4 heading into the third. “To this day I still get chills and shivers thinking about it,” said Hangsleben, who hit the post with a shot in overtime. “Our whole home town, they say it is 1,300 people but it’s probably closer to 1,000. We got down there and we played in front of 18,000. We had never seen that many people before. The Hornets eventually won in overtime, but Hangsleben had made enough of an impact to be named to the all-tournament team. He was named to the all-tournament team again the following year, as a junior, when Warroad lost to Edina in the quarterfinals and eventually finished in sixth place. Hangsleben scored three points during the 1969 tournament and four more in the 1970 tourney. Warroad was upended by East Grand Forks in the Region 8 semifinals in 1971, but Hangsleben’s career was far from over. A growth spurt transformed Hangsleben from a 5-7, 165-pound senior into a 6-1, 190-pound freshman at the University of North Dakota. He played three seasons for the Fighting Sioux, when he scored 92 points (37 goals, 55 assists). He was inducted into the hockey program’s Hall of Fame in 2006. Hangsleben, who lives in Lothian, Md., and is the longtime general superintendent for a roofing company, played 185 regular-season games in the NHL, most of them for the Washington Capitals. He also played 334 games in the WHA during his 10 seasons as a pro.